For patients who are bed-confined, require life-sustaining oxygen, or who are too weak to be moved, we are proud to offer Scheduled Ambulance Service. We provide rapid response to your emergency — providing the best possible outcome for the worst possible times. For critically-ill patients who need to be transferred between healthcare facilities, AMT is here to help. IPT provides services to hospitals and patients requiring compassionate supervision during transportation. For patients who are bed-confined, require life-sustaining oxygen, or who are too weak to be moved, we are proud to offer Scheduled Ambulance Service. Our team includes healthcare professionals speciallty trained to care for these individuals. Contact us if you or a family member need this service. We provide rapid response to your emergency — providing the best possible outcome for the worst possible times. All of our ambulances are equipped at Advanced Life Support (ALS) level. If you have an emergency, you can count on AMT. For critically-ill patients who need to be transferred between healthcare facilities, AMT is here to help. Our Critical Care Units are stocked with state-of-the-art equipment to ensure safe transfer for patients. We maintain direct contact between the physician and our paramedics or registered nurses during transfer. All of our units are equipped with advanced EKG systems, invasive monitoring devices and ventilators. IPT is a division of AMT. IPT provides services to hospitals and patients requiring compassionate supervision during transportation between healthcare facilities. The division is responsible for transportation throughout Illinois, except Cook County. Operated 24 hours a day, the service uses a high quality, technologically advanced fleet of automobiles. Call AMT's Communication Center at (309) 494-6200 to determine a patient's eligibility and receive a request form. The Illinois River is definitely one of Peoria's greatest natural resources, and provides commercial and recreational activity for many people in the area. 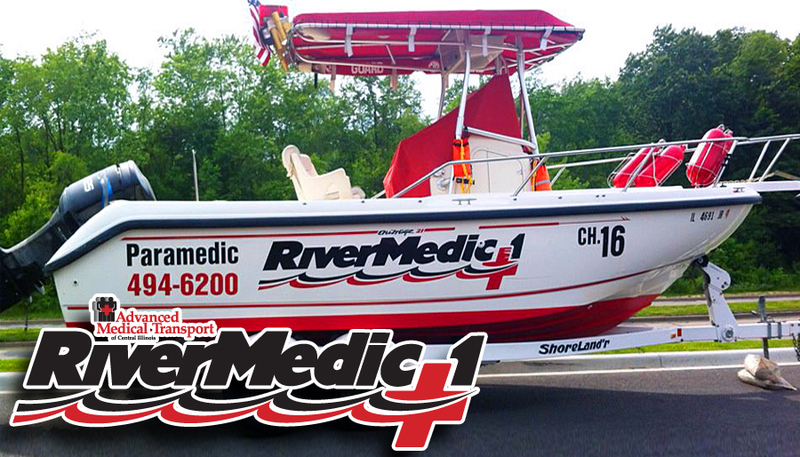 Throughout the summer months, AMT's RiverMedic1 cruises up and down the river assisting boaters, swimmers and water enthusiasts of all kinds with any medical emergency they may have. Staffed with a boat operator, a Paramedic and an EMT, the RiverMedic1 is equipped with all the same technology and drugs as a regular ambulance. Calls range from heat stroke to broken ankles, and occasionally injuries due to a boating or skiing accident. The crew members often cruise through the local marinas with promotional items and share a friendly minute with the boating community. Each year at the beginning of the boating season, the boat team hosts a lifejacket give-away at one of the public marinas. They fit children with new lifejackets and promote safe boating. These bike enthusiasts are regular AMT employees who enjoy biking as a hobby, and relish the exercise that riding provides. The team members participate in activities such as the Susan G. Komen Walk for the Cure, which draws around 30,000 participants, local parades, charity runs and festivals along Peoria's riverfront. 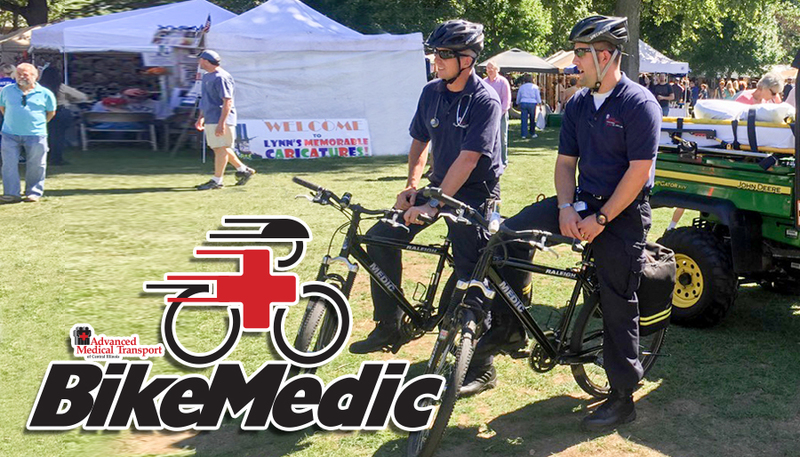 The idea behind the use of bikes equipped with saddlebags full of medical equipment began when crew members acknowledged the difficulty of accessing a patient in the midst of a huge crowd of people at major events in town. The use of a bike to get to the patient quickly and get them triaged, treated and prepared for transport to the hospital has saved the life of many area citizens.